“Mazi Baiko” is a Marathi phrase that means “The love of my life”. The photo that was shared by Aamir, it showed him and Kiran wearing the traditional Marathi attire. Aamir was wearing a white kurta with a pehta and Kiran was seen wearing a Lugade, which is a traditional Marathi saree. The jewelry that was worn by Kiran was nath and other gold garments that are worn together with the saree to complete the look of a Mulgi. Kiran Rao and Aamir Khan got married in 2005, the couple is the parents of Azad who was born in 2011. Junaid and Ira are the children of Aamir Khan with Reena Dutta, his first wife. 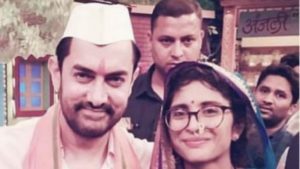 Kiran Rao directed Aamir in 2011 in the movie Dhobi Ghat, she also produced super hit movies like Secret Superstar, Talaash, and Dangal. Aamir Khan was last seen acting in Thugs Of Hindostan, it is reported that his next movie is Lal Singh Chaddha.